Founded in 1975 when Blai Farré started repairing machine pumps in a garage in Barcelona, Iberital has since grown to become one of Europe’s leading espresso machine manufacturers. Now, the company has its sights set on Australia. “Australia is a flagship in the world of specialty coffee. [It is] a market that is ahead in the coffee universe and a trend-setter,” Iberital Marketing Manager Francesca Torelli says. Iberital was first introduced to the Australian market in 2004 when it started selling its espresso machines to Robert Timms, one of Australia’s established coffee roasters. Iberital has since exported and sold its single boiler machines to Australia on a small scale through local dealers. 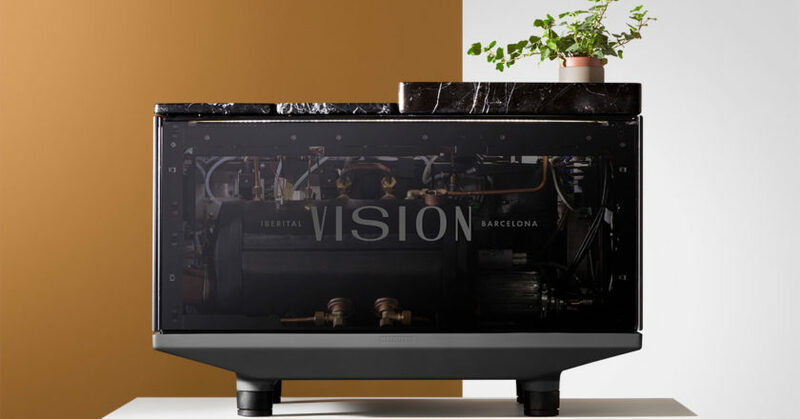 With the launch of the Iberital Vision, its newest espresso machine, Francesca says it is time for Iberital to fully engage with the Australian market. “[Iberital Vision] is the result of a broad study on the needs of baristas and a strong investment in research and development,” she says. Vision has neither screens nor buttons, and is instead operated with a simple, patented joystick system that allows for manual control of the brewing process. “Even though it appears analogue from the outside, its inside is thoroughly fine-tuned for custom use. Baristas can control temperature, pressure, and the amount of water used in every delivery to create signature, personalised coffee brew recipes,” Francesca says. 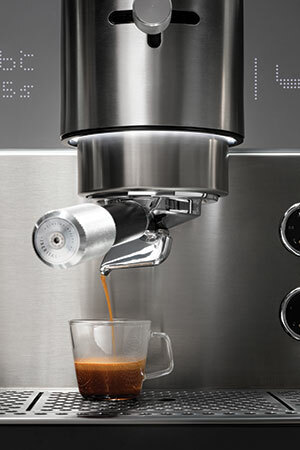 The streamlined interface of the Vision – along with its black and white stone, stainless steel, and light wood and glass finishes – has contributed to much of the acclaim the espresso machine has garnered for its design. Since its launch in May 2018, Iberital has received recognition from five international design awards for its new machine. The Iberital Vision espresso machine features a patented joystick system for manual control of the brewing process. The Iberital Vision won the United States’ Green Good Design Award, Italy’s A’Design Award – Platinum category, and Design Magazine’s Excellence in Design Award. It was also a finalist in Spain’s Delta awards, and is nominated for the German Design Awards 2019. Andreu Carulla of Andreu Carulla Industrial Design (ACID) in Girona, Spain is the mastermind behind the machine’s tailored look. “At Iberital, we strongly believe in creative minds. [ACID] contributed in all parts of the project to create a product with a disruptive design,” Francesca says. The Vision replaces a classic display screen with a detachable Android tablet that connects to the machine via Bluetooth. The tablet’s pre-loaded Vision app provides an easy tool for configuring all the parameters of the machine, statistical data monitoring, and sharing of recipes. The Iberital Connect telemetry system allows for remote operation and monitoring of several connected machines. Though its design and external connectivity has received praise, it is the technology encased within the Vision that really makes it shine. The Vision replaces a classic display screen with a detachable Android tablet that connects to the machine via Bluetooth. The Iberital Vision’s multi-boiler system has separate boilers for steam, each group head, and an additional independent water system. 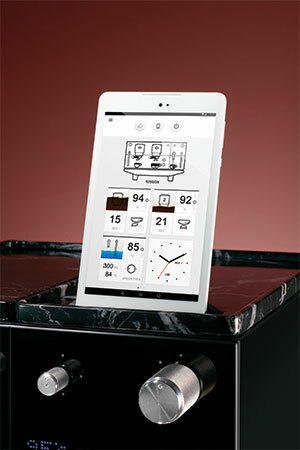 “[The multi-boiler system] allows baristas to define the temperature of each boiler separately. [They] can optimise temperature for multiple coffees, or simply extract the same coffee in different temperatures to obtain different notes and aromas,” Francesca says. Iberital designed the Vision’s independent water system to help the baristas get the best organoleptic result from their teas, infusions, and other brewing techniques such as the Clever Coffee Dripper or AeroPress. Four different programs available through the tablet give baristas the ability to acquire the quantity, quality, and temperature of water they need to prepare their beverages without needing any other equipment. “In other coffee machines, the hot water for tea and other infusions is taken from the service boiler which is also used for generating steam,” Francesca says. To further improve the quality of the drinks it produces, Iberital built Vision without using material known to be harmful, such as nickel or lead. Due in part to Vision’s nickel and lead-free design, Iberital received funding from the European Union (EU) as part of the Horizon 2020 work program to design the machine. The EU established Horizon 2020 to finance innovative projects from small- and medium-sized enterprises in Europe. The EU subsidised approximately 70 per cent of the cost of the project with a contribution of €1.6 million ($2.5 million). This funding made it possible for Iberital to implement features in the Vision that greatly reduce its carbon footprint. Iberital says the machine’s power saving features reduce wasted energy by up to 50 per cent compared to traditional espresso machines. Francesca says that while most espresso machines struggle with energy loss due to the need to keep water heated for immediate delivery, Vision uses several strategies to reduce this power consumption, including the machine’s Eco mode setting. This article appears in full in the December edition of BeanScene. To read the story in FULL, subscribe now.